There are not rules to decorate your Christmas tree. To avoid the "sausage effect" (branches bulging between tightly cinched garlands), start at the top of the tree and slowly increase the amount of garland between each wave as you work your way down the branches. 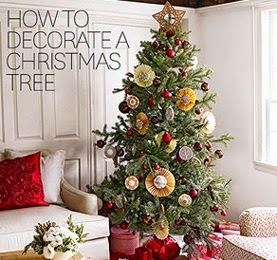 Plan to use about two strands of garland for every vertical foot of tree. We recommend you to be very careful to decorate the Christmas tree notes that the Christmas tree not stay with bulky branches and wreaths placed so that they are not tight). To place wreaths, should always start decorating Christmas tree from the top of the tree and gradually increase the amount of garland and distribute all garland on your tree. 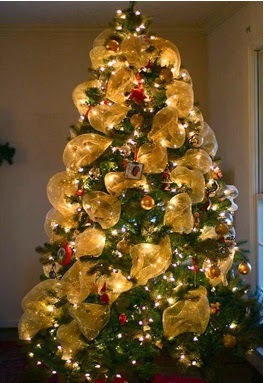 To make your Christmas tree look attractive It is recommended to use a variety of garlands from plain to fancy. Beaded garlands look best if hung from one branch to another. You can use pine wreaths, garlands made of thick paper, ribbon garlands. You can hang garlands around the tree or drop them from the top of the Christmas tree to the ground.